What is Attribution? Should I Be Doing More? So what is attribution? Simply put it is about assigning credit for sales and other desired actions or goals. It is used to try and understand how each channel contributes to the overall performance and ensure that advertising is targeted at users in the right place to have the most impact. Having worked on attribution with some big advertisers I have found that cross channel attribution is not an easy nut to crack. There is a lot of contention in the industry and there is no “right” answer or “one size fits all” approach that can take some of the pain away. I have been involved in a few attribution projects for businesses of varying sizes. 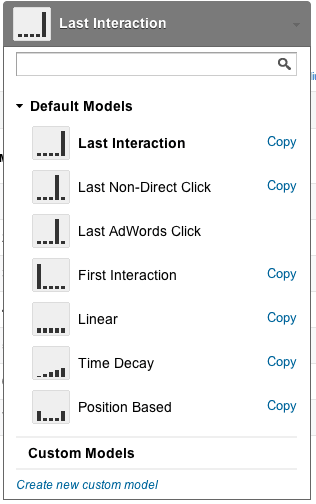 The most common problem is what attribution model to use (first click, last click, mid click and weighted models), the image shows a few models Google lists in the Attribution Model Comparison Tool. There is no real answer to which attribution model to use. I think that the issue arises from this question – which channel had most impact on each sale? That is really hard to answer as users’ buying habits are so diverse. Many users are now using multiple devices (sometimes at the same time!) which makes attribution even harder. It is a bit of a chicken versus egg situation where advertisers need to be have a model to analyse their data, but they need to analyse the data to see which model works for them. There are some great tools that can help improve tracking to assist with the multi channel and multi device cross over. These tools do come at considerable cost which can price a lot of businesses out. So what can you do if these tools are out of your price range? Remember nothing is 100% accurate – it is better to move forward with decisions based on data that is 80% right than to do nothing due to a lack of trust in the data. Please share this post if you’ve found it helpful and feel free to ask any questions in the comments section below.